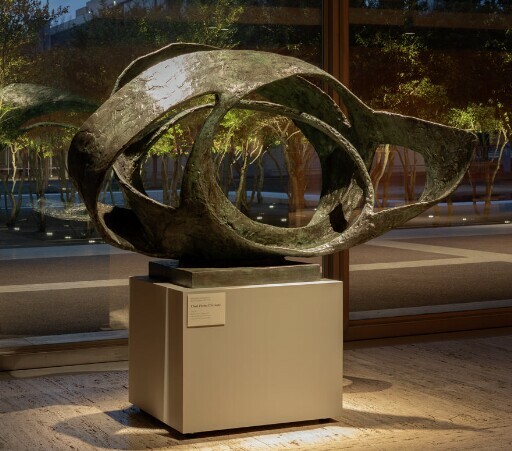 The title of this bronze by one of the leading abstract sculptors of the twentieth century discloses that its elliptical shapes were inspired by Hepworth’s experience of the rugged beauty of far southwest coast of England, where she lived and worked from 1939. Trezion was the name of the house she shared with her husband overlooking St. Ives, Cornwall. The bronze’s open, spiraling structure suggests coiling waves, caves, rock pools, shells, and other natural phenomena along the Cornwall’s stormy shores. Its textured surface and brown and green patina likewise evoke the rough coastline. Hepworth’s visceral response to landscape informed her sculpture, which bridged abstraction and naturalism, and allowed the viewer to be transported through physical sensations to a universal, spiritual response. In the mid-1950s, Hepworth turned from direct carving in wood and stone to work in bronze. Rather than working in clay, she covered armatures with plaster, building and carving the surfaces, to create molds from which she cast her bronzes. The open spaces of Trezion and similar sculptures from this time allowed her to create lighter and more transparent forms, as the contours of the curves created rhythmic movement and a rich interplay of mass and penetrable voids. Acquired by Kimbell Art Foundation, Fort Worth, gift of Ruth Carter Stevenson in honor of Kay Fortson, 2011.